Located in the heart of Makati, Manila's business and financial district, The Peninsula Manila is strategically placed on the corners of Ayala and Makati avenues. The Peninsula Manila is close to premier shopping facilities, fashionable restaurants, discos, music bars, boutiques and central to the most prestigious business addresses, multinational companies and foreign embassies. 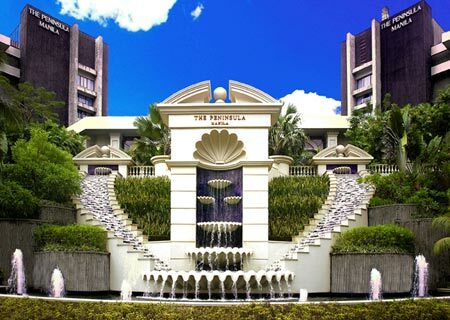 The hotel is a 30 minute drive from Ninoy Aquino International Airport and just 20 minutes from Manila's Domestic Airport.The Peninsula Manila offers a range of hotel facilities including The Peninsula Spa and Fitness Center, a luxurious oasis within the hotel with gymnasium, swimming pool, sauna, steam room, and massage treatments. A dedicated business center, 14 meeting rooms and specially-outfitted accessible rooms. The Peninsula offers some of Manila's top restaurants that includes modern European, Italian, and a diversity of Asian cuisines. The Lobby at The Peninsula continues to be Manila's favorite meeting place for a drink, afternoon tea or other refreshments.Elegantly furnished in classic style, The Peninsula Manila's 498 rooms and suites provide modern, technologically advanced conveniences, including complimentary broadband Internet access for all hotel guests. The Club Floor has been designed with the needs of business travelers in mind and offers an exclusive Club Lounge, serving complimentary continental breakfast, afternoon tea, and cocktails, as well as a boardroom, Business Center, and Butler service. Standard room amenities include a work desk, fax machine, complimentary high-speed Internet service, 2-line IDD phones, voice mail, bedside control panel, black-out drapes, mini-bar, in-room safe large enough for a notebook PC, stereo, iron and ironing board and marble bathroom with separate bathtub and shower.